Ethiopian Airlines! ET ! ETH ! De quoi être exigeant sur les avions. Re: Ethiopian Airlines! ET ! ETH ! DUBAI -- A few hours before Ethiopian Airlines announced its order for 12 Airbus A350-900 aircraft yesterday, I had a chance to sit down with CEO Girma Wake to discuss his airline's plans for global expansion with its three new aircraft types, the A350, 777-200LR and 787. I started off by asking Mr. Wake about the role of his newly purchased A350 and how it will fit in along side the 787 and 777-200LR. "These are complementary [aircraft] for us," wake says. 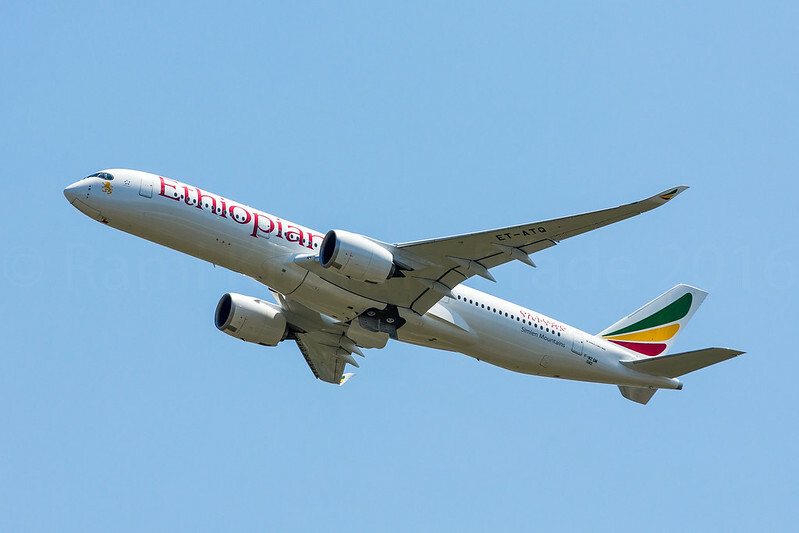 "The 777-200LR has a very good range and especially from the Addis Ababa Airport, its very difficult with the altitude." "We are at 8,000 feet above sea level. It's very difficult to get full benefits of engine performance. With the 200LR we get very good advantage with performance. Secondly, we have been growing the last five years -- 20% year over year -- and that necessitates an airplane that can take over 300 passengers. And the airplanes that we have today, the 767 carry about 270 passengers and the load requires we go over 300 [passengers] and that is why we picked the 777-200LR and we expect that the 787 to do the mid-range for us. The A350 will also help us operate the long range with that older fleet. Both of them can serve on the same route." I asked Mr. Wake directly about his airline's order for the 787 and Ethiopian's role as the African launch customer of the type and whether or not the title still held. "Yes, that is still the case," he replied. "We are taking all of the airplanes that we have ordered." Wake says his airline's first 787 is now expected in mid-2011, which is around the same time Ethiopian will be "taking most of our 777s." He also revealed that two of the 10 787s on order would be 787-9s which would be delivered "sometime in 2013'. With the performance of the 787 an open question until flight testing begins, I asked Mr. Wake about the prospect of early aircraft being delivered to the airline overweight. "There is an overweight situation. We are not very happy that it is over weight," says Wake. "But even considering the fact that it is overweight, we believe that for our mid-range routes, it is still a very attractive airplane like Europe to Africa [and] within Africa. And if we can leave the Far East and the American operation to the 777 and the A350, the 787 will definitely be a very good replacement for us for the 767 and 757 routes. It will still be a lot better." Wake says that Boeing is trying to "come up with various solutions" to meet contractual range, payload and fuel consumption targets for the 787-9, adding that "If they come up with a solution, we will take the -9. If they don't come up with a solution we will keep the -8, we have that in our contract. In any case, initially only two -9s were contracted for us, but if it does not work we can still go with -8, but we'll take all the [orders]." I then asked Wake about the introduction of the A350 and his airline's plans for the new long-range widebody set to arrive in 2017. "We have plans to dry lease some A350s before that if we see that demand is picking up, the new sectors that will come up gradually will be Brazil - Sao Paulo- more points in the USA, we want to fly to Canada and we want to expand to more points in the far east like Shanghai, Kulala Lumpur, so on and so forth," says Wake. Wake made a point of saying that Ethiopian Airlines will double in the next five years growing 20% year-over-year. Currently Ethiopian moves 3 million passengers per year. "We had a very small fleet before. Diversification when you only have 30 airplanes is not a bad thing to do, but when you have 50-plus [aircraft], you can still accommodate it. Diversification is not cheap. So, if you have the right quantity you can still do that and we believe now we have the right number of airplanes in our system that we can diversify, he says. 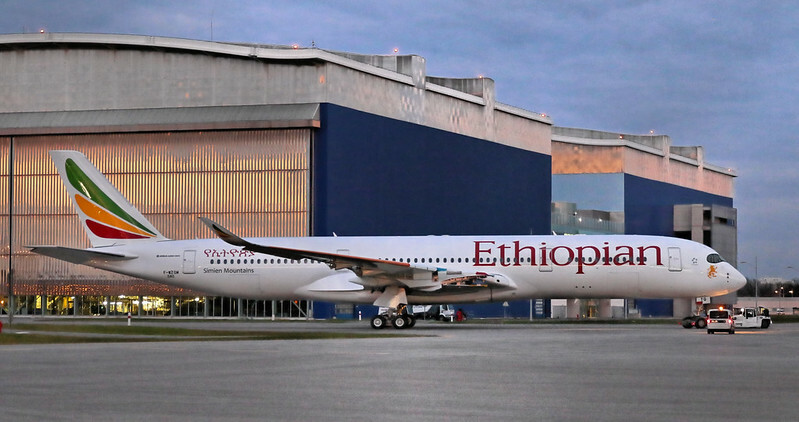 ETH client de lancement africain pour le 787. Maintien sa commande. Intéressant que l'arbitrage entre les version -8 et -9 du 787 dépendra des perfs du -9. Si il atteint les perfs contractuelles, il sera choisi, sinon ça sera le -8 qui sera utulisé pour du moyen ou long courrier. Ethiopan Airlines va acquérir 10 B737-800. pour étendre son réseau au départ de Lomé au Togo. Sur la première photo, on se rend compte que c'est quand même un gros avion ! Après vingt ans d'une guerre imbécile, l'Ethiopie et Érythrée on décidé de cesser les hostilités et de se rapprocher. Ethiopian va donc inaugurer une liaison Addis Abeba - Asmara en B787 à la mi juillet . Ethiopian reporte l'Achat de 20 A220 afin de voir comment l'acquisition par Airbus évolue (traduction on veut payer moins cher). Je ne serais pas surpris qu'Airbus offre plus d'A320neo. Pour mémoire Addis est à 2300 m d'altitude ce qui place la barre très haut pour les besoins avions. Pour l'uniformisation, ce ne sera pas le cas avant les 2-3 années à venir .... ? Et ça donne quoi ? La pénalité du A220 à ADD et à 2300 m d'altitude, en MTOW par exemple ? le plus intéressant est de définir un système cible, vers lequel on s'efforce de converger au mieux, et au plus vite, des deux côtés. Au passage, "communité" en français, Poncho. Le financement. Sinon je ne crois pas qu'Airbus modifiera les systèmes de l'un ou l'autre à court moyen terme. Et si celà arrive, ce ne sera surement pas les commandes de vol.